Ambiance™ is an “environment enhancer” designed to help you create the perfect ambient atmosphere to focus, relax or reminisce. * Ambiance has now had over 5,000,000 Sound Downloads! * Ambiance™ has been featured in every Apple store on every iPhone! * Ambiance has been featured in MacWorld Magazine! * Ambiance has been named in the top 100 best apps by O’Reilly! 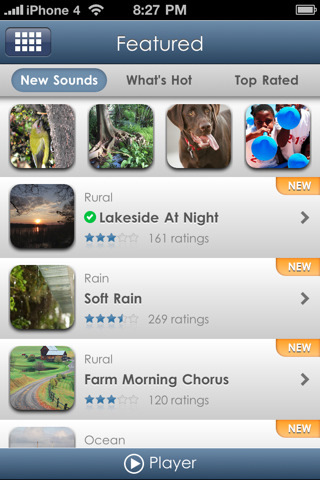 * Ambiance is one of the iLounge Essential 100 apps of 2009 and 2008! * As seen on ABC News, Ambiance has tons of new and Amazing features! * Ambiance has been in the New York Times, Wall Street Journal, Washington Post and many other major publications. * Ambiance has spent months in the top 100 paid apps list! You can choose from over 1000 free sounds, exclusive to Ambiance, to download and listen to, create customized sound mixes, cycle through playlists, wake up to relaxing sounds and more! Create your own Ambiance today! * Fully Customizable Alarms and Alarm Themes. * New Sounds added constantly. * Choose a select handful of Premium sounds to purchase, in-app. * Mix in your own music from iTunes seamlessly. * Find Hundreds of sounds, from White Noise static to French Cafes, from Binaural Beats to Farm Sounds, choose any sound to help you Easy Relax or fall aSleep. Ambiance™ does not have any included sample sounds. You can download as many free sounds from the server as you want — if you have an internet connection. If you do not have access to a wifi connection, you will not be able to get new sounds into Ambiance until you do. Like every app, download speeds are greatly affected by your connection (edge, 3g or wifi). Edge downloads might take a little longer, 3g is faster and wifi is blazing fast to download sounds in Ambiance™. Unable to run Ambiance™ on your iPhone or iPod?